Good Morning My Creative Friends!! Welcome to our "Dia de los Muertos/A Celebration of Life" Blog Hop! We decided to call it this because we wanted people to know that it wasn't a hop about honoring death itself. Okay, I landed up adding more doodling & used my FAVORITE I-Rock to bling up my card! Oh, I also added that sentiment from Papertrey Ink! ﻿*** We have a grand price! From SEI we have the following from the Monsterville Collection: 12x12 paper pack, stickers, googly eyes, Build-your-own paper monster , Die cut sayings and 6 chalk inks! In order to qualify for the grand prize, you will have to leave a comment on each blog. OMG I knew I was going to like your project... but... AMIGA!!!! I not just love it! I REALLY REALLY LOVE it!!!!!! Gracias for being part of this!!! This is an amazingly adorable card. Very fitting for the day of the dead celebration. You did a Super job!! on this project!!! Love it!! This is such a neat card with the embossing and the Action Wobble Spring! Hi, I totally love the card it is great to see the picture it is fantastic when you watch the wobble in your video. I already checked the AWI website to find out where you can buy them but could not find it on the website maybe you can help? I just bought Rock Princess for my daughter and with your card in mind we will even enjoy it more. Thank you for sharing. This card is sooo cute, and I didnt think I would say that about skulls lol. Love the wobbles, I have never seen them before. I wonder if you could buy them in Canada, I hope so. You always do such nice things thanks Emma. I really love your card, the foil background really works well. Love how you put the skulls together. That Wobble device is so awesome. Great card and giveaway. Thank you for sharing. Love your card it is supper cute. Great card!!! Love that action wobble effect!! You make it look so easy! Thanks for showing us how to do this and for the chance at some wobbles! I gotta get some of those!! Gotta have some Wobbles. Where can these be purchased? They would be awesome on so many projects. Ok....I LOVE your card!! The silver backgroud is awesome!! Your little wobble head skeleton rocks!! I am always blown away by your projects! Thanks!! This is absolutely brillant. SO amazing. TFS! how beatifull card and how awesome product I need it!!! What a cute card! Thanks for all of your great ideas. What a great card and awesome product! I would love to try out the wobbles! Thanks for sharing! love love your card so pretty. Emma~ I love love love this card! all of your details are just wonderful! and the colors go soooo great with the foil! just awesome! and i love those wobblers too- hope im the lucky duck - hehe! Emma es tan bonito! Love it! Fantastic card. I love the added bling! Love the card and the wobbles. I have never heard of this celebration but think that it is wonderful to celebrate the ones we lost. This is adorable!!! I love those Wobbles, it just adds to the card! WOW, EMMA!!!!!! You are truly amazing! Another beautiful card!!!!! Emma, I Love your skeleton card. It is absolutely adorable!! I would love to win a pack of those wobbles they are awesome! Cute card. Never heard of wobbles but they look fun to use. We celebrate something similar called all souls day and saints day. love the card dear emma. OMG, I love, love your card with the bobble head skull!! Thanks for the chance to win some wobbles.. Happy Dia de los Muertos! Emma an amazing card. Love the idea, the colors and the skulls are so cute. Your the Bomb...KABOOM! This is a super card...would love to try some of those wobbles!! Thanks for inspiration!! Great job and thanks so much for sharing. Your card is so adorable Emma. Love the wobbles too. The Wobbles are very cool! Your card is Amazing! Thanks for sharing! I just love your card and those action springs are awesome. Thanks for sharing. Super cute card! Those wobbles are awesome I love how it gives it so much movement. So super cute!!! I love it! always so creative my dear Friend!! another amazing project from Emma, I just love your videos. I LOVE the WOBBLES!!! How fun! Loved your video! Off to watch your other videos too--my computer wasn't playing nice yesterday. I LOVE this card!! The wobbles bring so much life to the card! Really cute card. The wobbles are awesome. i LOVEEEEEEEEEEEEEE your card, so super cute. I am so inspired by you. I'm going to stop being intimidated by my gypsy and get to work. Thanks so much for the inspiration. Wow, I love this card. All your work is amazing. No wonder Madison likes you so much:) You really inspire her. WOW! Love your card and I love the wobbles idea! Very cute and thanks for sharing! I am loving this card Emma. Your awesome. Emma, this card is sooo awesome! Love the colors, Love it. Emma, I always love your creations but this one is adorable with the wobbles.. I would love to win them. (can you tell me where I could buy them? So many posts I doubt if I will win.) Thanks for sharing your amazing talent. I must have missed what cart. you got the hat from. hugs. 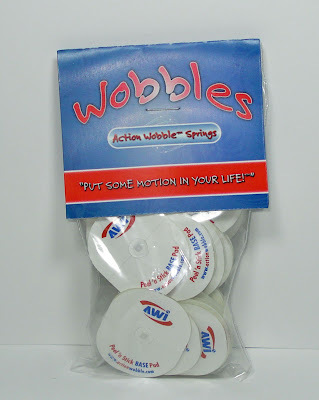 I just got my action wobbles too :). Aren't they the funnest. I love your card! Great job and such fun. me at glorajean dot com. What a FUN FUN FUN card. Thanks for the idea. love the wobbles. Wow that really brings your card alive. I love it! Thank you for sharing this beautiful card and great video. Wobbles are wonderful, will have to try them on one of my projects. Wow Emma!!! Another beautiful creation. I love the embossed shiny background and the gem details. I enjoy making action cards so these Wobbles would be used a lot. great card Emma! I love the silver and the colors.. its like everything else you make... BEAUTIFUL! tfs! Wow!!! Emma Awesome card!! I love those wobbles!! How cute is that. What an amazingly beautiful card! 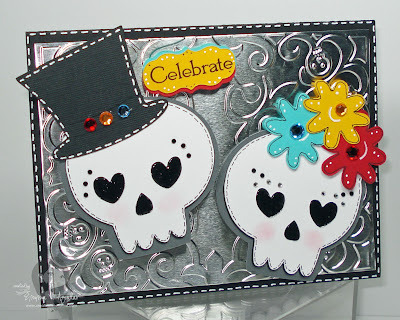 I love yor skulls and the embossed metal background! What an adorable card and I just LOVE the movement!! I will be celebrating this awesome holiday next year. Thaks for the inspiration!! Beautiful as always Ms. Emma!!! I love that embossing! Love the card. Great job as always!! Hi Emma, Another great card as usual. Those Wobbles sure give the card a new cute dimension. Ok, just when I think you can't outdo yourself Emma, you come up with a project even cuter than the last. LOVE the Wobbles too - can you let us know where to buy them? I can't find them on-line and they are now on my 'must-have' list! PS I got your new DVD today - can't wait to watch it!! OMG Emma, this is just gorgeous I LOVE it!!!!!!!!!!!! This is so great! Love the embossing! Hi Emma~ I just love this card! Uber fabulous...the wobbles are cool too! Here's to hoping I win...I never win so it would be fun. Thank you again for your terrific shares. Wow, this is an awesome card!!! Very blingy and not too frightening, lol! Emma~I loved your card, with all the embellishments!! Great blog and terrific projects. Love the skulls. Thanks for sharing. Wow, Wobbles are cool! Must find some. Or better yet, win some. What a cute project! I also love the "wobbles" :) Thank you for sharing your ideas. Hi, Luv it!! it's so cute!! I've never seen the wobbles before. I'd like to win them and try them out. Que bonita tarjeta, me gusta mucho! I haven't been on a hop in a long time! new about life in someone elses world. sooooo happy to win those! *PICK ME*!!! What a great card. I just received Rock Princess in the mail and haven't had time to explore yet. This looks like a first! I just love the WOBBLE skull! TFS! Love your colors and of course, your bobblehead! I think I found my new favorite embellishment in the WOBBLES!! what a fabulous idea!! your cards are simply adorable! Super cute card. Funny, my Mom just mentioned about someone using "springs" on a card she saw at a shower this weekend. I had not seen them before. They are SOOOOOOOO cool. Super cute skeletons! Love their eyes. Thanks for the hot tip in the video great blog candy! This is so CUTE!!!!!!!!!! I love it!!! Wow can you tell I am excited I love it Emma! As always, Emma, very cool project. Those springy things are way too much fun! What a great card! Love the silver paper. I would love to try the "Wobbles". :-)Thanks for the chance to win some. Thank's for having a clip of how the wobbles work!! They are so cool and would love to have some!! TFS!! I love your card. The foil and embossing is so pretty. The "wobble" on your skull gav it just the right touch. Super cute!!! Super great project. Thanks so much for sharing. I always love your projects Emma! This one is no different, Love It! Where can we get those Wobbles? I would love to get some. This card is beyond amazing!! WOW! What a great card and those wobbles look AWESOME! Wow Emma what a great card! I love it! It really captures the spirit of "The day of the dead!" Super cute card!! Gracias and love the hop!! That is such a cute project. Love it. Oh my goodness this is so cool. I love the way the head wobbles. So cool! Emma as always... you rock !!! Very, very nice card. So Cool!! You are awesome with those little touches!! Love the Wobbling action!! TFS!! Take Care!! Nice card!!! Does not surprise me, your projects are always so detailed. I think this is my favorite project of thr blog hop, not I don;t think the others are not pretty... because, I just found amazing talent...but yours is soooo pretty!!!! I just found you and your videos. They have really helped me. Today I just learned that you can click on an image in the top bar of the G and it will tell you what cart is on. Thank you. whoulod love to win thank you for the chance. wowowow, your card is fantastic!!!! This celebration is important in my country because it is a reunion of the dead with the living and something that represents joy!!!! Kisses, and I hope to be lucky!!!! I'm a mexican scrapper!!!! oh this is beautiful! I love the colors and just how this card looks! I am already a follower and love your blog! Emma I just LOVE every one of your creations and the idea of using those wiggle things!! SO SMART! Would so LOVE to use those in my card making! i love your blog!!! you always make such cool stuff & give such great instructions!!! OH MY GOSH! This is adorable and so dang cool! I love it!, the paper is awesome too. Thanks for a chance to win...On to the next blog, this is really cool Emma! Emma I really love your card. Also the wobbles really make it pop. Awesome Day Of The Dead card. I love how you used the cuttlebug folder with the skulls, it is perfect. Another GREAT card. I really enjoy watching your video's I come ever evening to see what you have new, and I have learned so much more about my gypsy watching you. Neat card that hat with the bling reminds me of mardi gras or a witch dr. So many occassions to use it with very cool. The bling is awesome and that wobbles thing is way fun. Aaah! That is SUPER cute! I love the wabbles! How fun is that? Beautiful Emma!! The silver background showcases your card perfectly! Wow what an amazing project I am not surprised on how bueatifl this card is. Thank you so much Emma for always inspiring us. What a great idea! Bobble heads for our cards etc! Thanks for sharing. emma, your card is awesome! It really reminds me of Mexico and great memories! just love it! What a darling card, I actually won this cart last night on ebay for 18 bucks! Yay me!! You keep getting BETTER and BETTER -- and this card is truly the bEST ever! Love the embossing and the skulls. Thanks so much for the excellent tutorial video, as always! That card is great! Thanks for the giveaways! Beautiful Project! It is amazing! Thanks for the inspiration. So stinkin cute. Sorry if this is a second comment. Got interrupted along the hop and couldn't remember where I left off. Love your blog always so inspiring and wonderful creations. Just love this card!! Those Wobbles are awesome!! You picked the perfect skulls too! Love the silver background on the card...AND the giveaway is really cool! OMG! Those Wobbles are so neat! Where can you buy them? I think I might "need" some! Supper super cute card LOVE it!!!! Wow, what a wonderful project. Thanks for the giveaway. OMGosh Emma, this is too too cute!!! I think it's going to be in my top 10 favorites of yours! Love what you did with foil, have actually been thinking of doing something like that with my CB (so if you see it on my blog, I wasn't copying, it's just "great minds think alike)! :) AND I LOVE, LOVE, LOVE the wobbles. I'd love to know where we can find them! What a cool project. Those wobbles are so neat. Can't wait to get me some. such a neat idea!! I love the wobbles and can't wait to get my hand on them! OMG Love this card you made:) It is adorable. The wobbles seem fun, can't wait to get some! Emma, I love your work! The silver background is fabulous and thanks for showing the Wobbles! Very cute card. I love the Wobbles. Great project! Love the Action Wobbles. They really make a card stand out. Thanks for sharing! Who knew skulls could be so cute! Great job! i love this card!!!! really cute!!!! I loved seeing how you used the Gypsy in making this card. I was so glad to see what the Wobbles were and how you used it. Great card, love the wobbles! THIS IS SOOOOO AWESOME...LOVE IT!!!! !